According to experts in early childhood development, brain development between ages birth and age 3 is exponential. This critical period lays the foundation for brain functioning the remainder of a child’s life. Research in the last 10 years has repeatedly documented concerns associated with screen time/media exposure at early ages. Several studies concluded that children who rely heavily on media exposure at the expense of direct interaction with their world have areas of their brain that do not fully develop. Further since brain formation is complete by age 3, the deficit could well be permanent. Thus, it is critical that children engage in a range of activities that develop all areas of the brain. A longitudinal study conducted in 2010 and reported in the May 16, 2011 Journal of Pediatric and Adolescent Medicine concluded that early exposure to media is associated with reductions in audible language development, interfered with parent child interaction time and decreased the child’s involvement in play activities. Further that rapid scene changes common in media developed for young children appears to have “direct, adverse effects on the developing brain”. The American Academy of Pediatrics recommends that children under age 2 have no screen time and at ages 3 – 5, screen time should be no more than 1 hour per day, ideally with the child’s parent participating. The one exception is video phone calls such as Face Time or Skype. Research in the 1970’s & 80’s looked at commonality among early readers. Findings indicated that children who played with manipulative toys and children who were characterized as “lap readers” (regularly held on parents’ laps and read to) tended to learn to read at a much earlier age than those who had not. This finding was contrary to commercial advertising for early educational systems. Child Development Centers are an ideal place for children to put away the screens and interact with the world. 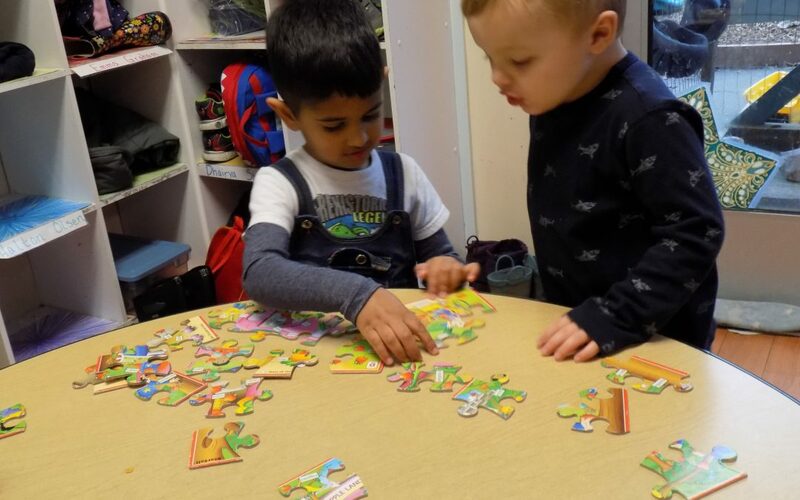 Using their 5 senses and reinforced by well trained, attentive adults, James’ Place Child Development Center encourages child development in all domains. Children learn language through conversation, exposure to literature, music and interactions with staff and peers. Peer interactions reinforce social skills, cooperation, problem solving, conflict resolution and empathy. Rigorous physical activity is critical to physical development for young children. It provides a growing sense of mastery as children are able to maneuver increasingly more demanding equipment such as riding a trike, riding a scooter, climbing a climber, jumping and landing on their feet. Interaction with small muscle equipment such as blocks, balls, scissors, beads for threading, puzzles, etc. furthers the sense of competence and mastery, develops hand eye coordination and exercises the problem solving parts of the brain. Small muscle play also promotes growing independence as children become able to dress themselves, zip zippers, button buttons, Velcro then tie shoes, etc. When I originally announced the policy of absolutely no electronics at James’ Place, there was initial skepticism. Colleagues questioned, “What about ..(the newest and shiniest ‘educational’ toy that blinked and beeped)”. Over time it became apparent that our experience with the policy has promoted rich relationships between staff members and children based on daily, personal interaction and shared experiences. As early child development center teachers, watching children interact with the the world through play is awe inspiring. Every day we see children growing, learning, mastering the world and feeling competent and successful. In the spirit of full disclosure, I have to admit that one staff request to access a live stream was granted. The preschool class watched the solar eclipse on the NASA web site. The viewing was followed by a discussion and the children drawing their version of the event. In our opinion, the evidence is clear. Limit screen time, interact with your children and encourage them to explore the world.